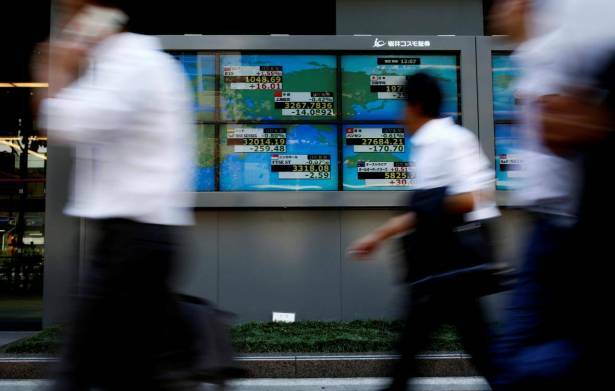 Asian stocks steadied on Wednesday, taking a breather after the previous day's surge, lacking the momentum to keep up with a global rally spurred by gains for tech shares on Wall Street and miners in Europe. The dollar initially wobbled against the yen following campaign-rally threats by U.S. President Donald to force a government shutdown over funding a border wall, but it eventually squared the losses. Spreadbetters expected a mixed start for European stocks, forecasting Britain's FTSE .FTSE would open 0.15 percent lower, Germany's DAX .GDAXI to start 0.05 percent higher and France's CAC .FCHI to open unchanged. MSCI's broadest index of Asia-Pacific shares outside Japan .MIAPJ0000PUS, which initially inched up to a two-week high, pulled back to stand little changed following a 0.7 percent rally on Tuesday. Australian stocks were down 0.3 percent and South Korea's KOSPI .KS11 gave back earlier modest gains to slip 0.1 percent. Japan's Nikkei .N225 bucked the trend and rose 0.3 percent, lifted as the dollar strengthened against the yen. Financial markets have been buffeted in recent weeks by heightened tensions on the Korean peninsula, turmoil in the White House, and growing doubts about Trump's ability to fulfil his economic agenda. Stocks, however, continue to attract buyers in an environment where bond yields remain relatively low and companies have largely notched up strong earnings. "The return of bargain hunters after a shallow correction in U.S. markets again demonstrates that investors are reluctant to reduce exposure to equity markets given low bond yields, solid profit growth and a lower US$," said Ric Spooner, chief market analyst at CMC Markets in Sydney. "In a situation where earnings yields on stocks remain attractive in relation to bond yields, investors are reluctant to respond too negatively to 'risk events' unless they represent a clear and present short-term danger." The dollar was flat at 109.535 yen JPY=, coming off the day's low of 109.370 plumbed after President Trump told supporters in Arizona "If we have to close down our government, we're building that wall" in reference to his pledge to tighten immigration at the U.S.-Mexican border. The greenback remained clear of a four-month low of 108.605 yen plumbed last week, when turmoil in the White House and geopolitical tensions took a toll on the currency. "The dollar had been caught in a downtrend amid ebbing expectations towards U.S. inflation. It requires a surge in U.S. shares to break this pattern and that is what happened as Wall Street rallied," said Junichi Ishikawa, senior FX strategist at IG Securities in Tokyo. The dollar also drew support as U.S. Treasury yields rose and pulled away from two-month lows as some of the risk aversion that gripped the broader markets last week began to ebb. The dollar index against a basket of six major currencies was little changed at 93.514 .DXY after rising 0.5 percent the previous day. The euro was steady at $1.1759 EUR= after slipping about 0.5 percent overnight following weaker-than-expected German investor confidence. A gathering of global central bankers on Friday in Jackson Hole, Wyoming, has also prompted investors to rebalance their currency positions ahead of the event, leading them to reduce some of their short dollar bets. Speeches from Fed Chair Janet Yellen and European Central Bank President Mario Draghi will headline the event, although neither are expected to announce any significant policy. In commodities, Brent crude LCOc1 slipped 0.35 percent to $51.69 a barrel after data from the American Petroleum Institute showed a crude stockpile decline largely in line with expectations and a surprise build in gasoline inventories. Copper on the London Metal Exchange CMCU3 was down 0.3 percent at $6,562.50 per tonne after striking $6,649 on Tuesday, the highest since November 2014. Spot gold XAU= was a shade higher at $1,285.50 an ounce, after losing 0.5 percent overnight as the precious metal felt the pressure from a stronger dollar. Spot gold had reached a nine-month high above $1,300.00 an ounce on Friday.